That old saying seldom rings more true than it does with the recent cease and desist letter sent out by Jack Daniel’s. It seems that Patrick Wensink, an author, used a cover for his book that was quite similar to the trademarked label of Jack Daniel’s. 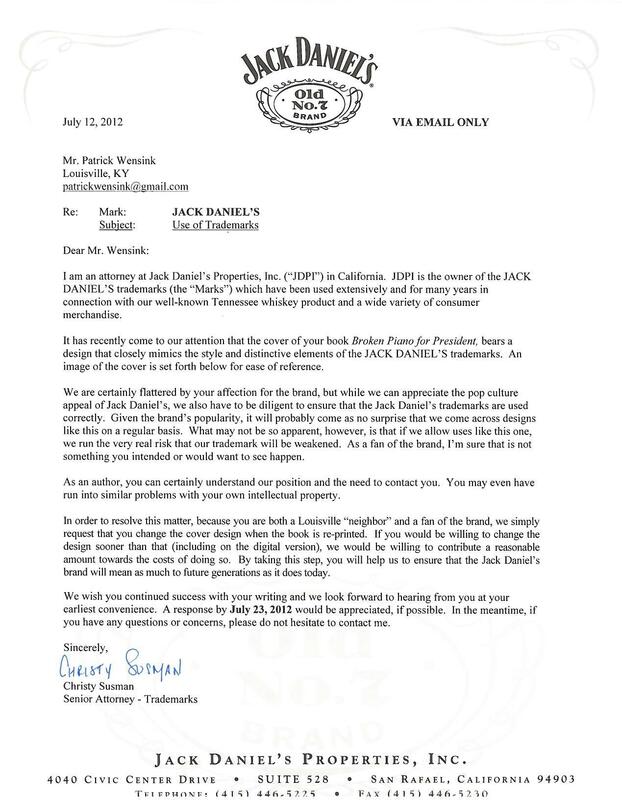 Rather than send him a scalding and legalistic attack letter, Jack Daniel’s chose to respond politely, going so far as to say that Jack Daniel’s was “flattered by [Wensink’s] affection for the brand” and offering to pay the costs of redoing the cover if Wensink chose to do so prior any reprinting of the book (but not demanding that Wensink do so). Wensink was so impressed that he posted the letter on his website, along with the following comment: “What follows is, perhaps, the most polite cease and desist ever written. If it wasn’t signed by some lawyer, I’d imagine ol’ Gentleman Jack penning it himself, twirling his bushy mustache.” The polite approach, being a quite atypical response, caught the attention of more than a few netizens, and the story went viral. As a result, instead of creating bad blood with a heavy-handed response to an underdog unknown author, Jack Daniel’s has secured the kind of publicity that money simply cannot buy. As of this writing, a Google search for “Jack Daniel’s polite demand letter” yielded 141,000 hits from all over the world, with the feel overwhelmingly positive. The way this turned out really shouldn’t have been such a surprise. As Barbara Streisand taught us, being heavy-handed in such situations can backfire mightily. A few years back, she sued a photographer documenting coastal erosion for $50m for posting a coastal photo online that happened to include her residence. Before her suit, “Image 3850” had been downloaded 6 times, two of which were her attorneys. One month later, the photo’s site had been visited 420,000 times. The term “Streisand Effect” has even been coined to describe an unnecessarily heavy-handed approach to such situation. At present, the term has its own website with the offending photo of Streisand’s residence, and has likely been viewed by millions. The takeaway here is that infringed parties and their lawyers cannot adopt a “one size fits all” mentality with regard to cease and desist letters. while there is a time and a place for stoutly defending one’s rights, the value of knowing when such a response is and is not appropriate can be immeasurable.